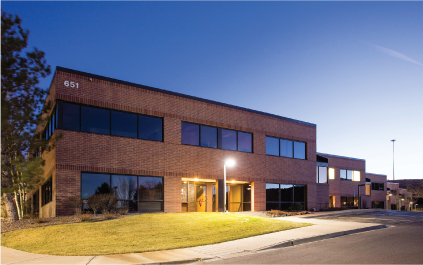 Lafayette, CO, April 5, 2018—A two-story office building in Golden will soon become more energy efficient thanks in part to the state’s commercial property assessed clean energy (C-PACE) program. The program, a public-private partnership, relies on private capital, not taxpayer funds, to help commercial property owners finance energy efficiency projects with affordable, long-term, non-recourse financing. Denver-based Integro developed the project for the 62,742-square-foot building, which is located at 651 Corporate Circle. Built in 2000, the building will receive new rooftop heating and cooling units, LED lighting, and lighting controls. The project—the third C-PACE project for Ogilvie Properties, the building’s owner—is projected to reduce electricity consumption by 44 percent and increase the property’s value by an estimated $517,000. Group14 Engineering conducted the energy audit of the facility as part of the property owner’s larger effort to reduce operating expenses and improve the efficiency of the facility. ANB Bank, a regional bank with locations in Colorado, Wyoming, and the Kansas City metro area, funded the investment, which totaled $470,000.